LaVelle Henderson of Waco, 77, said this time of year brings back memories of her old North Waco neighborhood, where a special relationship was forged between a Jewish shopkeeper and a Baptist Church during the Great Depression. The merchant, Benny Green, had no children of his own, which might account for his affection for the children of the area around his 19th Street and Reuter Avenue shop. They called themselves the "Reuter Rats," Henderson recalled. One block down and one block over, at 20th Street and McKenzie Avenue was North Waco Baptist Church, a large congregation of several hundreds led by the preacher W.D. Boswell. The children of the church for many years could look forward to a special treat come December from Green, a leader of Congregation Agudath Jacob Ä… then the Orthodox synagogue of Waco. "Mr. Green would fill sacks with fruit and nuts and even some penny candy and give them to the little kids," she said. "He was quite the beloved figure in the neighborhood." Henderson said she and her siblings were not allowed to get in line for the largess, "because we had enough to eat at our house," unlike some of her playmates. But she did look forward to candy Green gave out when her parents paid their grocery bill. Born in 1895 in Germany, Green came to the United States in 1909, settling initially in Minnesota. In 1914, he joined that state’s National Guard, and in 1916 was sent to Texas to join in the chase for Mexican revolutionary Pancho Villa, who had he raided Columbus, N.M. This act provoked the unsuccessful Punitive Expedition commanded by Gen. John J. Pershing, which failed to capture Villa after a year in pursuit. Green returned to Minnesota to muster out, but re-enlisted after the outbreak of World War I. Sent back to Texas Ä… this time to Waco’s own Camp MacArthur, he trained for overseas duty. While in France, he survived a mustard gas, and a chlorine gas attack that nearly killed him. 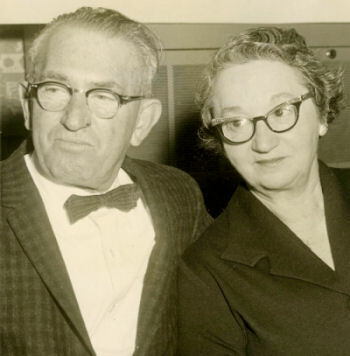 He married a local girl, Reva Levy of Waco, in 1920, but returned to the north for a year as a salesman. But the foul weather taxed his weaken lungs so much that they couple moved back to Waco for his health, for good. He peddled "Green’s High Grade Coffee" to raise the funds to open his first business in late 1921, a grocery at 19th Street and Reuter Avenue, in an 800-square-foot wooden shop with a leaky roof. He soon added a variety store, the first in "suburban" North Waco, and then came a show repair shop, barbershop, dry cleaners and drug store. Green told an interviewer in 1966 that his commercial empire, dubbed Greenway Shopping Center, was literally at the end of Waco in those early days. "The street car stopped there," he said. Billy Joe Southwell, 78, who grew up in Waco to open a grocery of his own in the 1950s, recalled Green’s generosity of spirit as America’s economic fortunes turn south after the giddy heights of the 1920s. "When I was just a child, our family bought our groceries there," he said. "He gave my widowed mom food on credit, to feed us six kids. We wouldn’t have survived (the Great Depression) if it wasn’t for Benny Green." Southwell opened his first grocery in 1948, at 1819 Alexander. But in 1965, he moved the business to Greenway Center, 19th Street at Reuter Avenue. And thus, his old benefactor became his benefactor became his landlord. Arnold Miller, 80, whose mother Nell was the twin sister of Green’s wife, Reva, recalled that in those days, most folks made a daily trip to the grocery store, as much for social reasons as to stock up. Miller said he earned his first nickel as a working man through his Uncle’s employ, as a pre-teen stock boy in the Green grocery. "He was a great believer in helping the less privileged," Miller said. In the mid-1930s, Miller recalled, his uncle opened a dance hall on old Lake Waco, Green’s Terrace, where the big bands played, folks like trumpeter Harry James and Bob Wills and his Texas Playboys. Besides Battle of the Band events, there were marathon dances held — contests in which people competed for money and prizes to see who could stay on their feet the longest. "We came out one Sunday morning to find the place gone, burned to the ground," Miller said. Frank Levy, another of Green’s nephews, said, "I had heard for years that he kept no end of people in North Waco from starving to death during the Depression." One time, on a sales call decades later, Levy said, he mentioned Green’s name, and his client told him, "I was one the people he saved!" The woman said that as a child in the 1930s, when her parents couldn’t afford medicine for her illness, Green bought it and just added it to their (mostly unpaid) tab. "She told me she wouldn’t be alive today without my uncle’s help," Levy said. Besides the grocery, Green was a commercial landlord as well. He added other goods and services to the corner he worked: a drug store, feed store, cleaning and pressing shop, barbershop, "5 and 10-cent" store, an ice house and shoemaker’s shop. Some he owned, but most he leased space to, said Miller. In the 1960s, the Green grocery was sold to the family of his nephew, Leon Jacobson. Many of the buildings he added to the Greenway Shopping Center are still standing, although in sorry shape. Condemnation stickers are found affixed to the doors and windows. Green was known as the "Mayor of Greenway," for his influence in the North Waco neighborhood. But he was also a "mocher" (big shot, in Hebrew) in the city as well, having served as a mayor pro-tem for Waco and a long-time alderman. Green was active with Congregation Agudath Jacob of Waco, formed in 1886 when 15 Orthodox Jewish families brought Rabbi Samuel Levy to Waco. Levy served an astounding 62 years until his death in 1948. In 1894, the congregation erected a frame synagogue at 624 Columbus Ave. and in 1914 a new brick synagogue was erected at the site. Green was instrumental in the construction of the congregation’s home from 1950-1972, at 15th Street and Jefferson Avenue. In 1966, the traditional Orthodox community voted to affiliate with the Conservative movement of Judaism. With Hanukkah just around the corner, followed soon by Christmas, Henderson said, she thanks God for men like Benny Green in her life. He led by example, modeling humanitarianism. "He went to his maker knowing that he brightened the life of a child," she said.